The Powerkube XXL horizontal baler is the largest baler in the range, with an overall length of 7852mm and a feed opening of 2100mm long x 1490mm wide. 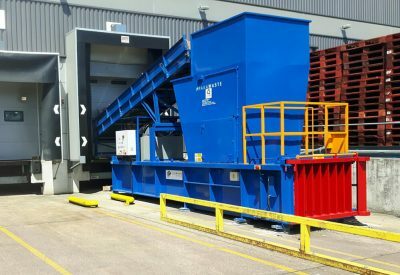 It also produces mill sized bales, but its extended loading aperture allows large items of waste and bulky cardboard boxes to be baled effectively giving up to 2000 kg per hour throughput. One of a range of materials handling options such as bin tippers or conveyors can be fitted to facilitate easy loading of the waste. Once the bale is made, the user is alerted by a ‘full bale’ light and tying the bale only takes a few minutes. The completed bale can then be taken away by a waste processor, often in exchange for revenue. For more information about our waste handling equipment, please contact our specialist team today!